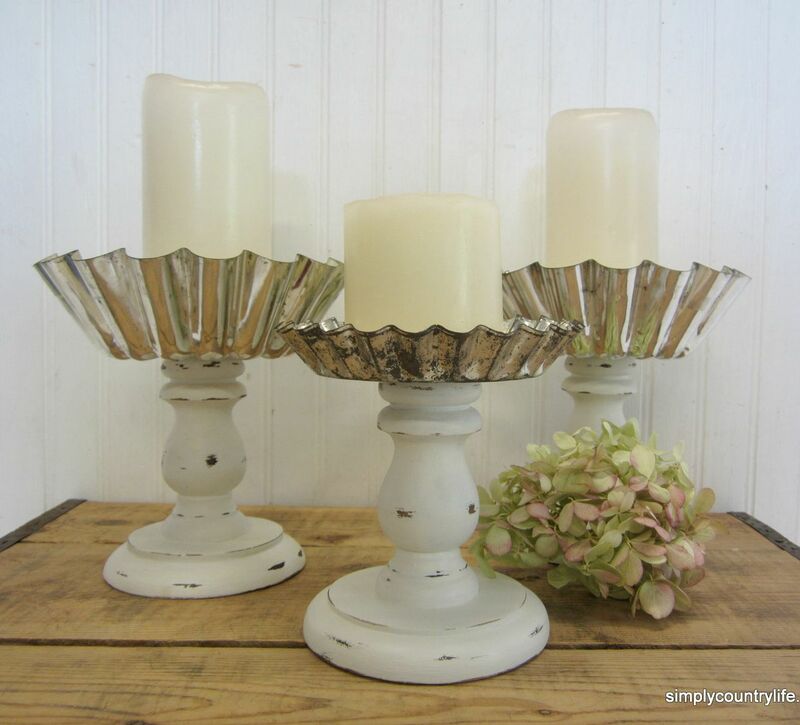 Vintage jello molds and thrift store candle holders were a perfect combination to create a set of farmhouse candle holders. We've all seen them at thrift stores - outdated wood candle holders. and just put them in my stash until inspiration strikes. I, kindof, had a plan for them. It involved some of the candle holders from my stash. You can click here to see another project using thrifted candle holders. I chose three candle holders from my stash to use as pedestal bases for each tin. I sanded, painted, distressed and waxed each candle holder. Then I found the center of each tin, marked it and drilled a small hole into each one. Then, using long wood screws, I screwed the tins onto the bases. and the smaller tin is a fluted tart tin, I believe. Last year I made a similar project using smaller jello molds that you can see here. I'm really liking the patina on the tins matched with the shabby bases. They make perfect candle holders. like seasonal items - pumpkins, vintage ornaments, nests and eggs. We love all things shabby, vintage, cottage and farrnhouse style. Great idea and so cute!!! Hope you are enjoying your summer. Thank you Sherri! You are such a blessing. Summer is going good so far, hope yours is too. Thanks Jillian! I'd love to join your link party. I'll be right over. I am going to make me some of these...they are just too cute! Thank you! I'd love to see yours when they are finished! These are so simple, but just so darn cute! I love this idea. Thanks so much for inspiring us at VIParty. Thank you Betsy and thank you for hosting such a fun party! I haven't ever aged metal myself but here is a link to a post that might help. Just popping back to say thank you for linking up at Shabbilicious Friday and to let you know that I'm delighted to be featuring your candle holders at tomorrow's party. Awe, thank yo so much Kerryanne. I'll be sure to drop by tomorrow and share the feature on social media! These are really cute, Adina! I'll be featuring them at Your Turn To Shine tomorrow. So glad you linked up with us! Awe Amy, thank you very much! !